Rosa Buonomo, of Stoney Brook Farm, recently saved a number of horses from slaughter according to News 12. News 12 reported that 17 Mustangs were headed to Mexico to be killed for their meat, but had to turn around when one of the horses gave birth on the side of the road. "Nobody wanted to help me," says Buonomo. "So then I just started rescuing them myself." Horses are popular in Connecticut. A 2002 study by the University of Connecticut estimated there were over 43,000 horses in Connecticut. Each town in Connecticut has its own zoning laws. The website for zoning laws in New Fairfield is http://www.newfairfield.org/content/58/default.aspx according to the Connecticut Horse Council. For the zoning http://www.cthorsecouncil.org/legislation/zoning. 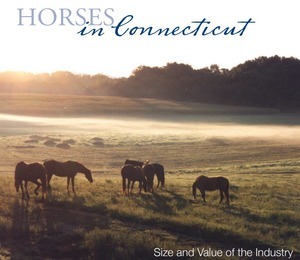 The UConn survey also showed that most horses in Connecticut are owned individually and by females. In addition, they found horse ownership in Connecticut is best described “as a personal recreational activity”. The report said the most common uses of horses are companionship (71%) and recreation (67%). Litchfield County has the most horses, with approximately 19% of the total. You can find further charts on the horse population here.